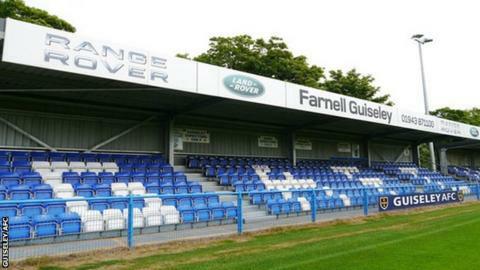 Guiseley AFC have been given planning permission to make ground improvements needed to meet the National League's minimum requirements. Nethermoor stadium currently holds only 3,000 spectators, with league rules requiring a minimum 4,000 capacity. The Lions could be removed from the National League next term if the works are not finished by 31 March 2016. The club plans to build new terraces, install a turnstile and improve spectator toilet facilities. "This is obviously a massive step forward for us in our plans to bring Nethermoor up to the necessary standards for this division," chief executive Adie Towers told the club's website. "It is just reward for all the hard work put in behind the scenes and serves as a real boost ahead of our debut season at this level."